The cost and health-related quality of life (HRQoL) burden associated with treatments for anaemia of chronic kidney disease (CKD) is not well characterized among non-dialysis-dependent (NDD) patients. Our objective was to review the literature on costs and HRQoL associated with current treatments for anaemia of CKD among NDD patients. The Cochrane Library, MEDLINE, Embase, NHS EED, and NHS HTA databases were searched for original studies published in English between 1 January 2000 and 17 March 2017. The following inclusion criteria were applied: adult population; primary focus was anaemia of CKD; patients received iron supplementation, red blood cell transfusion, or erythropoiesis-stimulating agents (ESAs); and reported results on HRQoL and/or costs. Studies that included NDD patients, did not compare different treatments, and had relevant designs were retained. HRQoL and cost outcomes were summarized in a narrative synthesis. In total, 16 studies met the inclusion criteria: six randomized controlled trials, four prospective single-arm trials, three retrospective studies, one prospective observational study, one simulation study, and one cross-sectional survey. All included ESAs. Treatment of anaemia (compared with no treatment) was associated with HRQoL improvements in five of six studies and lower costs in four of four studies. Treatment aiming for higher haemoglobin targets (compared with lower targets) resulted in modest HRQoL improvements, higher healthcare resource utilization (HRU), and higher costs. In NDD patients, untreated anaemia of CKD leads to higher costs, higher HRU, and lower HRQoL compared with initiating anaemia treatment. Relative to aiming for lower haemoglobin targets with ESAs, higher targets conferred modest HRQoL improvements and were associated with higher HRU. In this literature review, non-treatment of patients with anaemia of chronic kidney disease (CKD) who were not on dialysis resulted in higher costs and was associated with poorer health-related quality of life (HRQoL), which emphasizes the need for treatment. However, aiming for haemoglobin targets >12 g/dL led to seemingly modest HRQoL improvements of uncertain clinical significance. Improvements in the vitality domain appeared more robust than those in other domains. Effective treatment options with improved safety profiles are needed to improve the HRQoL of these patients with anaemia of CKD. Chronic kidney disease (CKD) is defined by the 2012 Kidney Disease: Improving Global Outcomes (KDIGO) guidelines as “abnormalities of kidney structure or function, present for > 3 months, with implications for health” . With a prevalence of 3–18% globally , CKD is an important public health problem associated with high rates of mortality and disability. The disease is caused by the progressive loss of kidney function and consequential accumulation of uremic toxins, which can ultimately lead to the requirement for kidney-replacement therapy (KRT; i.e. dialysis or kidney transplant), generally when glomerular filtration rate falls below 15 mg/dL [1, 3, 4]. There are few therapies that can reverse disease progression, and 3-year survival following diagnosis of end-stage renal disease (ESRD) is only 57% and 68% among haemodialysis and peritoneal dialysis patients, respectively . Kidney transplantation, the preferred treatment for patients with ESRD, involves a long wait or is not always an option: in 2015 in the USA, 99,120 patients were waiting for kidney transplants, yet only 18,805 kidney transplants were performed in the USA in that year. The median wait time for an individual’s first kidney transplant is 3.9 years . Therefore, the proactive treatment and preservation of kidney function are of utmost importance in pre-dialysis patients. The cost and health-related quality of life (HRQoL) burden of patients with non-dialysis-dependent (NDD) CKD increase substantially with disease progression while maintaining better overall HRQoL [7, 8, 9] and incurring lower costs  than dialysis-dependent (DD) patients. In the USA, the prevalence of CKD stage 1–4 is estimated at 30 million individuals and that of patients with DD-CKD at 500,000. As many as 70% of affected individuals could be undiagnosed and remain in primary care . In the USA in 2012, the average Medicare-insured patient with stage 1–2 CKD incurred annual healthcare costs estimated at $US17,969, and those with CKD stage 3 incurred costs of $US19,392 . Among privately insured patients, annual costs are estimated to be approximately $US10,000–12,000 per patient . Due to the high number of patients affected and the associated costs, NDD-CKD imposes a heavy burden on healthcare systems. Diagnosis of CKD may be prompted by patient-reported fatigue (or other symptoms) caused by anaemia, which is a significant contributor to the burden of CKD. Other patient-reported symptoms such as reduced mental activity, insomnia, and reduced libido have also been attributed to anaemia and contribute to reducing the quality of life of this patient population in CKD [13, 14, 15, 16, 17, 18]. Anaemia affects 8.4% of patients with CKD stage 1, increasing to 53.4% for patients with CKD stage 5 . Current therapies for anaemia of CKD include iron replacement, erythropoiesis-stimulating agents (ESAs), and/or red blood cell transfusions (RBCTs), the latter being used almost always as a rescue therapy. In NDD patients not on iron or ESA therapy, a trial of intravenous iron is recommended by current guidelines . Furthermore, ESAs are not recommended in this population unless haemoglobin levels fall below a threshold of 10.0 g/dL . The clinical utility of ESAs is dependent on balancing their efficacy with the concerns of increased risks of major adverse cardiovascular events (MACE) [20, 21, 22, 23, 24], and the fact that nearly 10% of patients are ESA-hyporesponsive. Their prohibitive cost forms an additional barrier that hinders access to this treatment class for many patients. Therefore, for a large number of patients with NDD-CKD, treatment with ESAs is ineffective, insufficient, inaccessible, or contraindicated as the benefits of ESAs do not outweigh their potential risks. Based on these limitations, clinical practice guidelines, as well as US and European regulatory agencies, usually recommend against intentionally aiming for haemoglobin treatment targets above 11.5 g/dl and discourage exceeding the 13 g/dL threshold with ESAs in NDD- and DD-CKD [20, 25, 26, 27, 28]. This relatively recent recommendation included in updated guidelines caused a reduction in the proportion of patients with NDD-CKD using ESAs from 2009 to 2013 [29, 30]. Regional disparities in the real-world clinical management of anaemia of CKD do exist, as exemplified by the fact that higher haemoglobin levels are achieved by real-world patients in regions such as Japan, Brazil, and Europe relative to patients in the USA . Thus, having an updated global assessment of the outcomes related to the treatment of anaemia of CKD is warranted. Four systematic literature reviews (SLRs) published between 2010 and 2017 reviewed the cost burden and/or HRQoL of anaemia of CKD [32, 33, 34, 35]. However, three of them were restricted to specific geographic areas or did not focus on patients with NDD-CKD [32, 33, 35], and the fourth studied the impact of ESAs on HRQoL based only on data from prospective randomized trials that included DD patients . The 2010 review by van Nooten et al. concluded that the evidence on the economic and HRQoL burden in NDD-CKD is limited but nonetheless substantial. Because randomized controlled trials (RCTs) are conducted in highly controlled settings that may significantly differ from real-world clinical practice, the applicability of RCT findings to the real world could be limited. In addition, periodically reassessing the economic value of treating anaemia of CKD is necessary, as evidenced by the drastic change in epoetin alfa’s cost effectiveness from 1990 to 2000 . Therefore, to provide an updated and global perspective on the economic burden and HRQoL outcomes of anaemia of CKD, we conducted a systematic review of the literature on the costs and HRQoL associated with current treatments for anaemia of CKD among patients with NDD-CKD and included real-world studies in addition to RCTs. Electronic databases, including the Cochrane Library, MEDLINE (including MEDLINE In-Process), Embase, National Institute for Health Research Economic Evaluation Database (NHS EED), and National Institute for Health Research-Health Technology Assessment (NHS HTA), were searched on 17 March 2017 to identify relevant publications in English. Studies were required to meet the following criteria: adult population (i.e. at least one patient aged ≥ 18 years); disease area was anaemia of CKD; iron/ferric supplementation, RBCT, or ESAs (i.e. epoetin or darbepoetin) were among the included treatments; study population was NDD (or, if both DD and NDD patients were included, outcomes were presented separately for NDD patients); and costs and/or HRQoL were among the outcomes investigated (Appendix 1). Cost outcomes included healthcare resource utilization (HRU), direct costs, and indirect costs. An HRU outcome corresponded to any measurement of the healthcare resources used by patients, which included medical visits (inpatient and outpatient) and use of rescue therapies (e.g. RBCT). Direct costs corresponded to costs paid by payers or to patients’ out-of-pocket costs, such as drug costs or medical visits. Indirect costs corresponded to costs ensuing from a patient’s inability to perform normal daily activities, such as work (i.e. loss of productivity costs). Exclusion criteria included strictly paediatric population (i.e. all patients aged < 18 years); study population was non-human (i.e. animal or cell-based studies); publication was a letter, editorial, comment, case report, biography, or address (i.e. not a study in which new results were generated); article was not in English; article was published before 1 January 2000. Studies that did not allow for the evaluation of incremental cost or HRQoL outcomes from a particular treatment (i.e. head-to-head comparisons between different treatments, dose-escalation studies, treatment switch studies, programme evaluation studies, etc.) were also excluded. This is because the design of these studies could not help achieve the objective of the current study. The study selection process was conducted in two steps (Fig. 1). First, titles and abstracts were screened by two independent reviewers (SR, L-AD [acknowledged], or FK-K [acknowledged]) for eligibility based on the aforementioned inclusion and exclusion criteria. Discrepancies in the decisions were resolved through discussion, and a third reviewer (PT-L) was consulted whenever consensus was not reached. Second, two independent reviewers (SR, L-AD, or FK-K) reviewed the full texts of studies retained in the prior step to determine their eligibility based on the same aforementioned eligibility criteria. Disagreements in decisions were resolved through discussion. When consensus was not reached, a third independent reviewer (PT-L) was consulted. Two independent reviewers (from MarksMan Healthcare Solutions LLP) extracted data from the full publications. Discrepancies were resolved through discussion. Contingent on availability, select variables were extracted from the included publications and recorded in an Excel spreadsheet (Appendix 2). Because study designs and outcomes were anticipated to be heterogeneous, a meta-analysis was not expected to be feasible; thus, results were summarized in a narrative synthesis. Although the clinical significance of HRQoL findings was often not assessed using minimal clinically meaningful differences (MCIDs), results were compared with MCID thresholds found in the literature (Appendix 3). Costs and cost differences were extracted as reported without currency standardization or adjustment for inflation. In total, 1625 unique publications were retrieved from the electronic search strategy. After screening by titles and abstracts, 418 (25.7%) full-length publications were assessed for eligibility. Of these, 30 (7.2%) met inclusion criteria. After eliminating studies that did not allow for the evaluation of incremental cost or HRQoL outcomes from a particular treatment, 16 (53.3%) were included in the current analysis (Fig. 1). Most studies (12 of 16 [75.0%]) were based on data collected before 2011 [16, 23, 37, 38, 39, 40, 41, 42, 43, 44, 45, 46]. 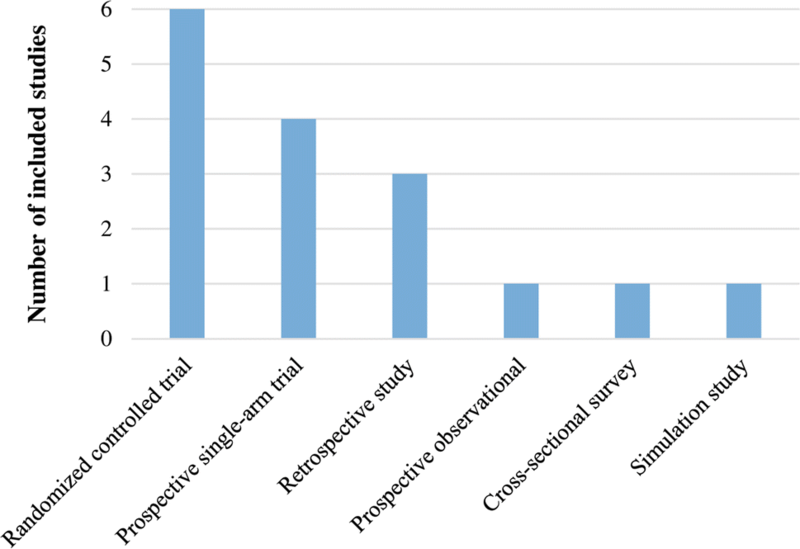 Six (37.5%) RCTs [23, 37, 40, 47, 48, 49], four (25.0%) prospective single-arm trials [38, 44, 45, 46], three (18.8%) retrospective studies [41, 42, 43], one (6.3%) prospective observational study , one (6.3%) simulation study , and one (6.3%) cross-sectional survey  were included (Fig. 2). Included studies comprised four (25.0%) real-world studies [16, 41, 42, 43], none of which had data collected prior to 2011. Cost outcomes were reported in three (18.8%) articles [41, 42, 43], HRQoL outcomes were reported in ten (62.5%) articles [14, 16, 37, 38, 40, 44, 45, 47, 48, 49], and both costs and HRQoL outcomes were reported in three (18.8%) articles (Table 1) [23, 39, 46]. ESA treatment was the intervention of interest in all included studies, including those with concomitant iron supplementation. No studies investigated RBCT (Table 1). Haemoglobin targets ranged between 9.0 and 10.9 g/dL  and 13.0–15.0 g/dL . Five studies (31.3%) did not specify a haemoglobin target [14, 16, 38, 41, 43]. Studies were conducted across a range of geographical areas: six (37.5%) studies in North America exclusively [16, 39, 41, 42, 43, 46], two (12.5%) in Europe exclusively [14, 38], and eight (50.0%) elsewhere (including international collaborations; Table 1 and Fig. 3) [23, 37, 40, 44, 45, 47, 48, 49]. Five of the six (83.3%) studies that reported on costs were conducted in North America [39, 41, 42, 43, 46]. Of the 13 studies that reported HRQoL outcomes, eight (61.5%) were conducted elsewhere (including international collaborations) [23, 37, 40, 44, 45, 47, 48, 49], three (23.1%) were conducted in North America [16, 39, 46] and two (15.4%) in Europe (Table 1) [14, 38]. 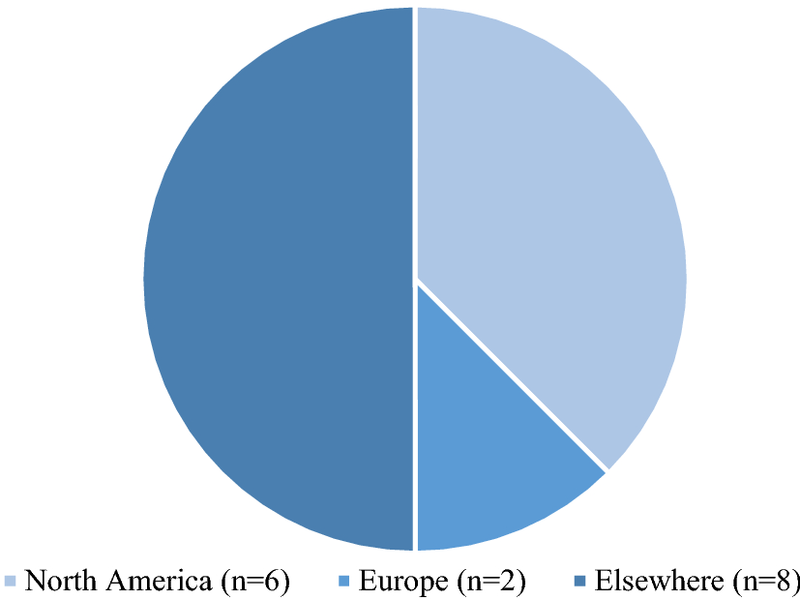 Among eight studies conducted in other or mixed locations, six (75.0%) were RCTs. For the three (18.8%) studies with data collected after 2011 [14, 47, 48], two were international collaborations [47, 48] and one was conducted in Europe . Among these 13 studies, the generic 36-Item Short-Form Survey (SF-36) was used in eight (61.5%) [23, 37, 38, 40, 44, 47, 48, 49]; the Linear Analog Scale Assessment (LASA) [23, 46], Kidney Disease Questionnaire (KDQ) [23, 46], Kidney Disease Quality of Life (KDQoL) [14, 16], and Functional Assessment of Cancer Therapy (FACT)-Fatigue [47, 48], were each used in two (15.4%); and quality-adjusted life-years (QALYs) , Functional Assessment of Chronic Illness Therapy (FACIT)-Fatigue , EuroQoL-5 Dimensions (EQ-5D) , and a customized approach  were each used in one study. While QALYs are not a measure of HRQoL, they were considered as such as they provide insight into the incremental gains in HRQoL associated with a particular treatment. Six studies with sample sizes ranging between 45 and 4038 patients compared HRQoL outcomes in ESA-treated versus ESA-untreated patients [14, 40, 45, 46, 47, 48]. In two placebo-controlled RCTs, HRQoL was generally improved by ESAs, although there were discrepancies observed between the statistical significance and clinical significance (MCID) of the results (Table 2) [47, 48]. Two single-arm studies reported significant HRQoL improvements after ESA initiation compared with baseline [45, 46], and that reported by Provenzano et al. appeared clinically significant (i.e. MCID reached; Table 2). The study by Hirakata et al. was an RCT designed to compare the impact of aiming for haemoglobin levels of 12–13 g/dL (with darbepoetin alfa) versus levels of 10–12 g/dL (with epoetin alfa). These levels were achieved after a ‘dose–response’ phase, during which patients in both cohorts achieved levels of 12 g/dL, and when HRQoL was assessed . The authors reported clinically and statistically meaningful improvements in HRQoL during the maintenance phase relative to baseline (Table 2). In contrast, a cross-sectional study by Eriksson et al. found that ESA-untreated patients had higher HRQoL than ESA-treated patients (Table 2). Five studies with sample sizes ranging between 25 and 1432 compared HRQoL among patients with high versus low haemoglobin treatment targets [23, 37, 39, 44, 49]. Two studies with sample sizes ranging between 371 and 1186 assessed the HRQoL impact of having different haemoglobin levels [16, 38]. In two RCTs, ‘vitality’ (i.e. a domain measuring general energy/fatigue) was clinically and significantly higher in the high haemoglobin target group [37, 49], whereas other SF-36 domains showed marginal improvements of uncertain clinical significance (i.e. MCID often not reached; Table 2). In another RCT, Singh et al. found non-significant improvements for patients randomized to achieve higher haemoglobin levels, except for the SF-36 domain ‘emotional role’. Moreover, after 8 months of follow-up on ESA treatment that aimed to raise haematocrit levels to 36%, Kawaguchi et al. did not find significant differences in HRQoL relative to baseline (some patients may have been treated at baseline; Table 2). A cost-utility analysis conducted by Clement et al. showed that gains in QALY relative to no treatment were smaller for haemoglobin targets of 11.0–12.0 g/dL and > 12.0 g/dL compared with a haemoglobin target of 9.0–10.9 g/dL (Table 2) . Two studies reported that higher haemoglobin levels were generally associated with improved overall HRQoL [16, 38]. Four studies with sample sizes ranging between 152 and 37,105 investigated the costs of treated versus untreated anaemia of CKD [41, 42, 43, 46]. In a single-arm prospective study, Provenzano et al. reported that the proportion of patients who required RBCT decreased from 11.1 to 3.7% after initiating ESA treatment (Table 3, Fig. 4). Using a retrospective cohort study design, Wish et al. found that patients with untreated anaemia incurred 17% higher direct costs than patients with treated anaemia (Table 3, Fig. 4). Using a similar study design, Maddux et al. concluded that ESA-untreated patients incurred 22.8% higher direct costs than treated patients (Table 3, Fig. 4). In a longitudinal retrospective study, Papatheofanis et al. 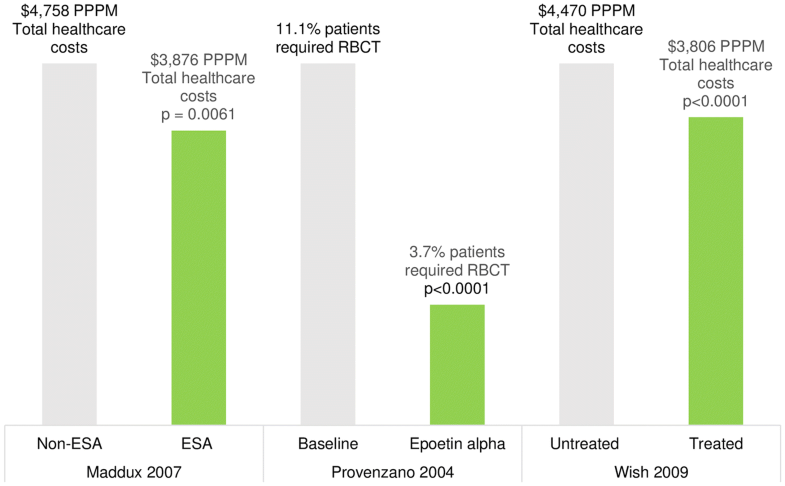 reported healthcare cost savings of $US4417 per patient per year after patients initiated ESA treatment (relative to baseline; Table 3). Two studies with sample sizes ranging between 438 and 1432 compared the costs associated with aiming for higher and lower haemoglobin targets using ESAs [23, 39]. With respect to HRU, an RCT by Singh et al. reported that the proportion of patients with hospitalization for a cardiovascular cause was 5% higher in patients randomized to achieve a higher haemoglobin target than in patients randomized to achieve a lower haemoglobin target (Table 3). In a cost-utility analysis, Clement et al. reported that the costs of aiming for a haemoglobin target > 12 g/dL were higher than those of aiming for a target of 9.0–10.9 g/dL (Table 3). The clinical guidelines and treatment landscape for the management of anaemia of CKD have substantially evolved in the past decade. Furthermore, regional differences in the disease management of CKD-related anaemia make it difficult to compare studies and summarize existing evidence across regions. Thus, a global updated assessment of the cost and HRQoL burden of anaemia of CKD is much needed. This SLR qualitatively assessed the cost and HRQoL burden of anaemia of CKD in patients with NDD-CKD in a narrative synthesis of 16 studies. All eligible studies focused on ESAs, and some also reported on iron as a concomitant treatment. In general, HRQoL benefits associated with higher haemoglobin targets appeared modest and of uncertain clinical significance [16, 37, 38, 39, 44, 49]. However, improvements in the domain of ‘vitality’ were observed in two studies [37, 49]. Studies generally reported higher overall HRQoL in ESA-treated patients than in untreated patients [45, 46, 47, 48], although one real-world study noted that ESA/iron treatment was associated with lower HRQoL . In addition, studies showed that aiming for higher versus lower haemoglobin targets was associated with higher HRU and costs, and lower gains in QALY [23, 39]. However, despite the high acquisition costs of ESAs, leaving anaemia of CKD untreated resulted in higher costs and HRU [41, 42, 43, 46]; this finding highlights the importance of treating this condition from an economic standpoint. In summary, results from this narrative synthesis shed light on the unmet needs of patients with NDD-CKD and the substantial burden of current treatment. Aiming for higher haemoglobin targets led to seemingly modest HRQoL benefits compared with aiming for lower targets. While there is a clear association between haemoglobin levels and HRQoL [16, 50, 51, 52], treating patients to currently unachievable high levels of haemoglobin (not allowed per guidelines, high cost or lack of response) seems to have mitigated effects on HRQoL. The impact on fatigue-related domains appeared more pronounced in two RCTs, as ‘vitality’ was the only SF-36 domain with clinically and statistically meaningful improvements for patients randomized in higher haemoglobin target groups. The most significant HRQoL improvements ensuing from anaemia treatment are typically related to physical symptoms and fatigue, while other domains are more marginally improved . A study by Clement et al. reported on the impact of different haemoglobin targets on the QALYs and costs of patients with anaemia of CKD. With respect to QALYs, the authors found that the gains in QALY became more limited when aiming for haemoglobin targets above 12 g/dL. Similar results were obtained in a more recent cost-effectiveness analysis by Yarnoff et al. , which was not included in the present study since it did not focus on the impact of a particular treatment. Together, these findings may reflect the higher risks of MACE associated with ESAs and the high doses of ESAs required to achieve high haemoglobin levels. Among the pivotal trials that included HRQoL assessments, the CHOIR trial found non-statistically significant improvements in HRQoL, whereas the CREATE trial reported HRQoL improvements across all SF-36 domains assessed [22, 23, 55]. Part of this discrepancy might be explained by the fact that the CHOIR trial, unlike the CREATE trial, censored patients at KRT initiation (i.e. some patients became DD during the course of the study period). This also explains the exclusion of CREATE in the current SLR, as patients were not NDD throughout the complete duration of follow-up. Another difference that may contribute to this discrepancy is that patients included in the CHOIR trial had lower baseline haemoglobin levels and required ESA doses twice as high as those used in the CREATE trial to achieve similar haemoglobin levels. Two RCTs and two single-arm trials assessed the HRQoL impact of treating anaemia of CKD compared with non-treatment. In general, clinically meaningful improvements in HRQoL were achieved following treatment of anaemia of CKD with ESAs. A noteworthy exception is the cross-sectional study conducted by Eriksson et al. , who reported better HRQoL among ESA-untreated/iron-untreated than ESA and/or iron-treated patients. Furthermore, there may be differences between the recommended management of anaemia of CKD practiced during an RCT and that observed in clinical practice as reported in the cross-sectional study. Due to the limited number of eligible real-world studies (only three) that investigated HRQoL, it is challenging to confirm this hypothesis. Further research is warranted to address the paucity of real-world data on the HRQoL of patients with NDD-CKD. Collister et al. 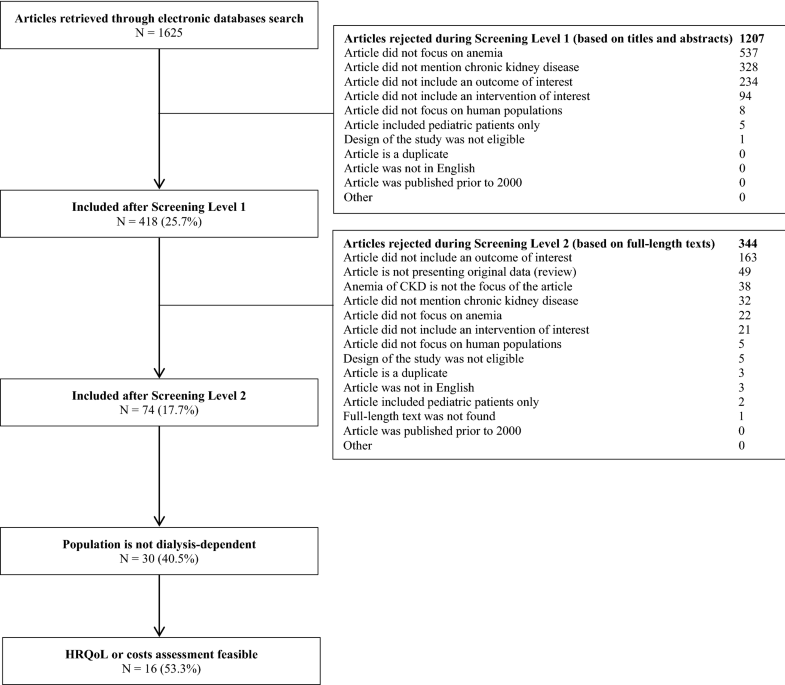 recently published a meta-analysis reviewing the impact of ESAs on the HRQoL of patients with anaemia of CKD. The authors did not find clinically or statistically significant differences in HRQoL associated with higher haemoglobin targets, which has been interpreted as an absence of meaningful positive impact of ESAs on HRQoL. The results from the present SLR suggest a more cautious conclusion should be drawn: ESAs do have an impact on HRQoL when ESA-treated patients are compared with their untreated counterparts. However, relative to aiming for lower haemoglobin targets, ESA treatment with high haemoglobin targets provides, at best, modest HRQoL benefits. This may be partially explained by the inclusion of study designs other than RCTs in the current SLR, such as prospective observational studies, prospective single-arm trials, and retrospective studies. With respect to the impact of iron treatment on HRQoL, only one study matching our search criteria investigated this question, and it focused on the effects of oral versus intravenous iron treatment. The authors found higher improvements in KDQ scores for patients treated with intravenous iron. Both routes of administration led to improvements in haemoglobin levels that appeared much smaller than those commonly observed with ESAs (i.e. oral: + 0.2 g/dL, intravenous: + 0.4 g/dL) . With respect to costs, the cost-utility analysis conducted by Clement et al. found that gains in QALYs associated with haemoglobin targets above 12 g/dL required much higher costs, a conclusion also drawn by Yarnoff et al. . This may be explained by a higher incidence of MACE when aiming for such targets. In support of this hypothesis, one RCT included in the present review found that patients randomized to achieve a higher haemoglobin target with ESAs had higher HRU . Four included studies consistently showed that the non-treatment of anaemia of CKD is associated with higher HRU and costs. One study by Provenzano et al. showed that untreated patients had higher HRU than ESA-treated patients, and three studies showed that non-treatment was associated with significantly higher costs than was treatment [41, 42, 43]. Notably, the study by Provenzano et al. was prospective, whereas the three other studies that reported on costs had a retrospective design, which further highlights the robustness of these conclusions with regards to study designs. Collectively, this suggests that, within the current standard of care framework, the higher acquisition costs of ESAs are offset by lower medical costs [41, 43]. As a cost-lowering alternative, epoetin biosimilars have been available in Europe since 2007 , and RETACRIT® became the first approved epoetin biosimilar in the USA in mid-2018. Biosimilars were estimated to have led to savings representing 15–30% of the price of the reference agent , suggesting savings of similar magnitude can be anticipated with biosimilar ESAs. Presumably due to initial safety, efficacy, and manufacturing concerns experienced in poorly regulated countries, biosimilars do not have a good reputation among certain providers and regulators. This likely accounts for the apparent underuse of biosimilar epoetin in some European countries [59, 60], which limits our understanding of how this may affect healthcare costs for anaemia of CKD. Findings of this literature summary review should be considered in light of several limitations. First, some studies may have been missed despite the scope of the rigorous search strategy used in the current SLR. For instance, studies that focused on ‘treatments’ as a whole, and did not specify the names of specific treatments, may not have been identified by the electronic search strategy. Second, because studies were heterogeneous in terms of study designs and choices of outcomes (e.g. choice of HRQoL measurements, HRQoL domains reported, HRU vs. costs reported, etc. ), this review could not quantitatively summarize study conclusions using a meta-analysis. Third, while a rigid cut-off derived from the literature was applied to HRQoL findings, an MCID should ideally be determined using study-specific elements. For instance, studies that included patients with better baseline performance status are less likely to report higher improvements due to a ceiling effect, which shows the importance of adapting the MCID to each study . Finally, the risk of bias and quality of reporting were not assessed because of the high heterogeneity in study designs. In this literature review, non-treatment of patients with anaemia of CKD who were not on dialysis resulted in higher costs and was associated with poorer HRQoL, which emphasizes the need for treatment. However, aiming for haemoglobin targets higher than 12 g/dL led to seemingly modest HRQoL improvements of uncertain clinical significance, although improvements in the vitality domain appeared more robust than those in other domains. Effective treatment options with improved safety profiles are needed to improve the HRQoL of these patients with anaemia of CKD. The study was funded by Akebia Therapeutics, Inc. Editorial assistance was provided by Analysis Group, Inc. 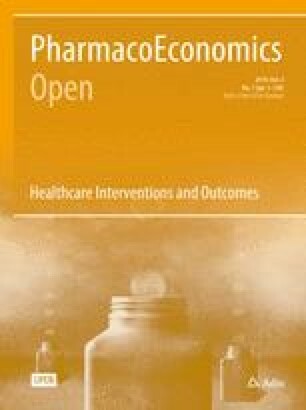 The authors thank Bostjan Ceh, Sunil Navani, Zalmai Hakimi, Jing Wang-Silvanto (of Otsuka Pharmaceutical Europe Ltd) and Andrew Garnham (of Clear Health Economics, London) for editorial comments and Marie-Hélène Lafeuille, Farzin Khosrow-Khavar, and Laure-Anne Damasse (of Analysis Group, Inc.) for help with the initial search strategy design and execution. This study was funded by Akebia Therapeutics, Inc (Akebia). All authors participated in the study design and interpretation of the data. Data analysis and original drafting of this manuscript were performed by SR and PT-L. All authors have provided critical feedback on the manuscript and approved the final version. PP received consulting fees from Akebia for work not related to this manuscript. RP-F participated in advisory boards from Akebia and Astra Zeneca and received honoraria from Akebia and AstraZeneca. WCW has received honoraria for unrelated work from Akebia, AMAG Pharma, Amgen, AstraZeneca, Bayer, DaichiiSankyo, Duke Clinical Research Institute, Fibrogen, Relypsa, Vifor Fresenius Medical Care Renal Pharma, and ZS Pharma. BS has participated in clinical trials for the treatment of anaemia on behalf of Akebia. SR, PT-L, and PL are employees of Analysis Group, Inc., a consulting company that received funding from Akebia Therapeutics Inc. to conduct this study. GS is an employee and stockholder of Akebia Therapeutics. AB is a former employee of Akebia and owns Akebia stock and stock options. MS and HBK are employees of Otsuka Pharmaceutical Development & Commercialization, Inc., a collaboration partner of Akebia in the development of vadadustat for the treatment of anaemia secondary to CKD. United States Renal Data System. Chapter 5: Mortality 2017. https://www.usrds.org/2017/download/v2_c05_Mortality_17.pdf. Accessed 23 Aug 2018. United States Renal Data System. 2017 USRDS Annual Data Report: Executive Summary 2017 https://www.usrds.org/2017/download/v1_00_ExecSummary_17.pdf. Accessed 29 May 2018. United States Renal Data System. Chapter 6: Medicare Expenditures for CKD [Available from: https://www.usrds.org/2014/view/v1_06.aspx. Accessed 8 Nov 2018. US Food and Drug Administration. FDA Drug Safety Communication: Modified dosing recommendations to improve the safe use of Erythropoiesis-Stimulating Agents (ESAs) in chronic kidney disease 2011. https://www.fda.gov/Drugs/DrugSafety/ucm259639.htm. Accessed 7 Feb 2018. European Medicines Agency. NeoRecormon—epoetin beta. http://www.ema.europa.eu/docs/en_GB/document_library/EPAR_-_Product_Information/human/000116/WC500024979.pdf. Accessed 14 Feb 2018. European Medicines Agency. Aranesp - darbepoetin alfa. http://www.ema.europa.eu/docs/en_GB/document_library/EPAR_-_Product_Information/human/000332/WC500026149.pdf. Accessed 14 Feb 2018.